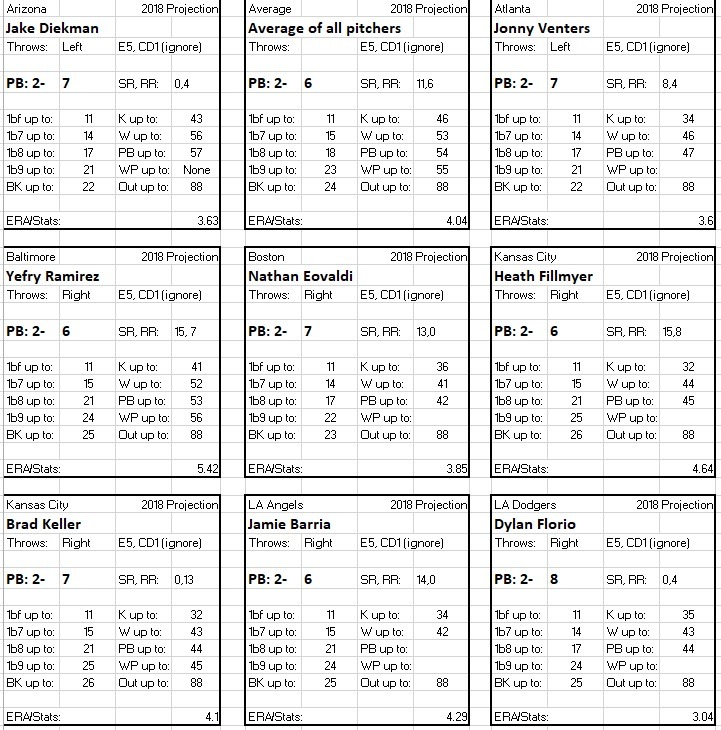 Before the All-Star break we posted these projected Statis-Pro cards of new players, played a game between them that the AL won handily, and ranked the new players. The Yankees dominated but Ohtani would have been the clear rookie of the year if he had been able to pitch as well as hit all year. 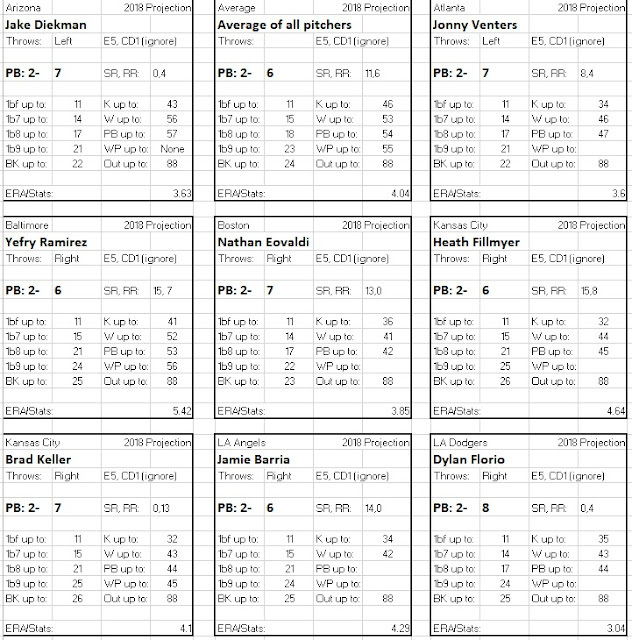 We noted that you can calculate your own players using this google sheet with formulas in place. Since then, another 20 new players made their mark so we calculated cards and included them in our games and pasted them below. A couple of interesting notes. a Home Run range of 27-32 is average which would be typical for a player with a batting average around .240 with average walks and average power (would have been considered very good power in years past. HOWEVER, if you notice a player's batting average in the lower right corner is higher than you would expect his hits to go (32 on average) that is because he has lots of walks that cuts down on the number of hits on the card because he had fewer hits per PLATE APPEARANCE but not per at bat. We list the batters first in order of team, and you can see Culberson goes all the way to 36 on hits, which is good, but his only home runs are on 34, 35 or 36, so his power is just one number below the average four home run numbers (remember this is a base-8 system, so 0s and 9s are skipped and 27-32 is actually four home run numbers. Ronald Acuna has one fewer hit number as he goes to 35 on hits, but he hits home runs from 28-35 so actually has excellent home run power with six home runs and with a couple of more walks is a little better player. 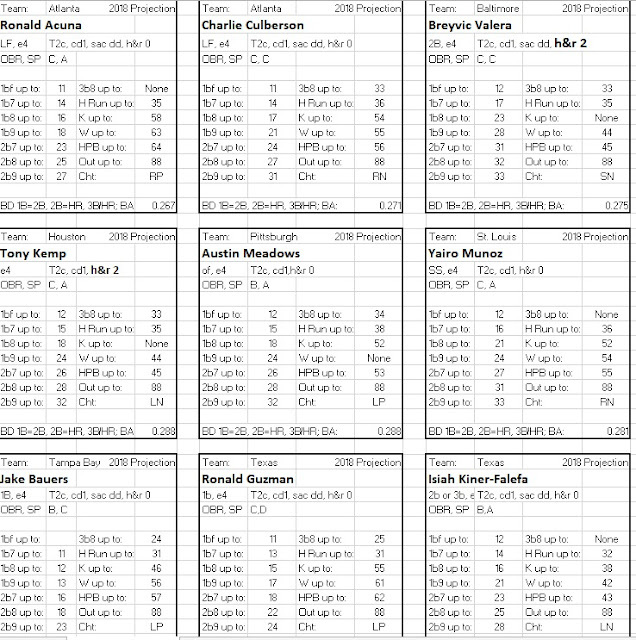 The other key I added is that if a batter draws a Clutch Batting (BD) chance with men on base, then his roll or Random Card of 11-88 still refers to his batting card BUT as noted at the bottom of the cards, you turn any 1b (single) on his card into a double and all runners score, you turn any 2b (double) on his card into a home run, and triples (3b) and homers (HR) stay the same. Any other result higher than a home run is just a foul ball so this is a free shot for the batter just as Clutch Defense (CD) is a free shot for a fielder. 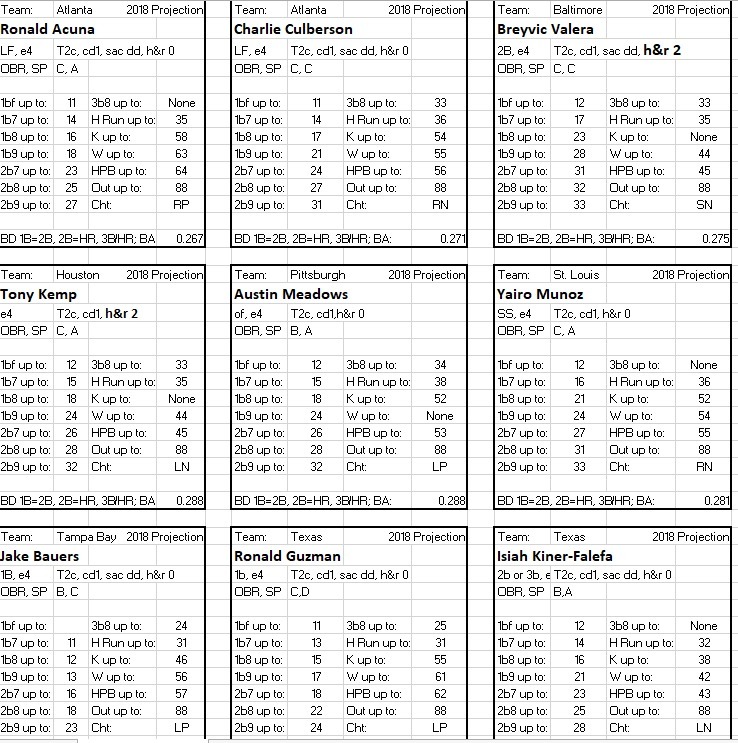 Here are the new batters, and then notes on the new pitchers below. 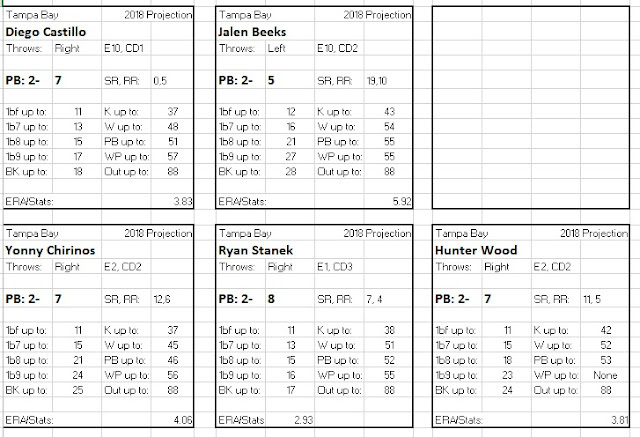 Five of the new pitchers are for Tampa Bay, so I will list them first and then the others. I may have added him too late for the A's to catch the Mariners and Astros as they are trying to do in real baseball, but the best new pitcher by far is Lou Trivino. 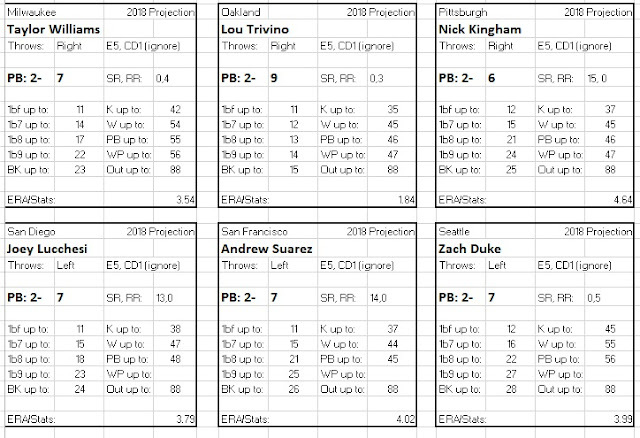 The top few pitchers in baseball have a PB 2-9, but the advanced version I do not play allows for pitchers to go higher and Trivino actually calculates on the sheet as a rare PB 2-10, which a few people like Bob Gibson in 1968 had. He is a reliever so cannot give a ton of innings, but in a pen that shut down everyone all year but does not have great cards from last year, he is actually the shutdown pitcher in Statis-Pro. 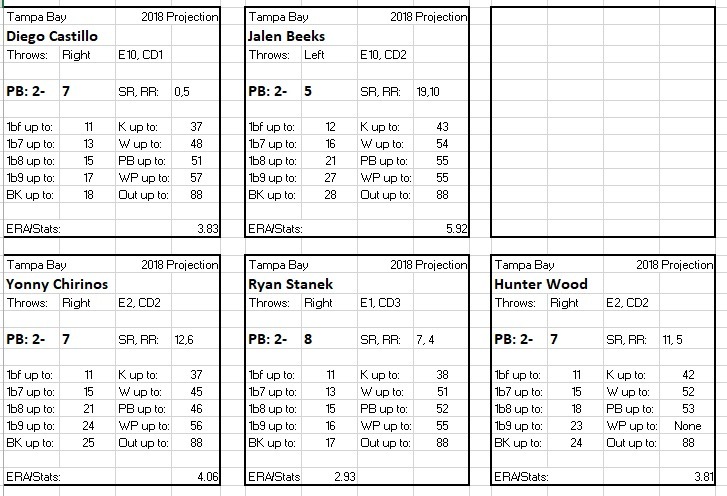 Back to the Rays - they need all these pitchers because they are experimenting with relievers starting many of their games, going a few innings, then turning it over etc. Ryan Stanek is their one PB 2-8 pitcher, the second-best rating, and he gave them a great start of a few innings to keep them form being the 5th place team in their division when I dropped it to four teams a division for the final few series. The amazing thing is that except for him almost every other Rays pitcher - new or old - is an above-average PB 2-7. You basically go from one decent pitcher, to another decent pitcher etc., but if your staff holds up and you still have pitching in the eighth or ninth you do not have any lockdown closer or even setup pitcher to lock up a win. The problem is they do sometimes end up all getting tired by the late innings which then leaves you with the new pitcher below Jalen Beeks or Tyler Glasnow, who they received from the Pirates for their one legit starter Chris Archer. 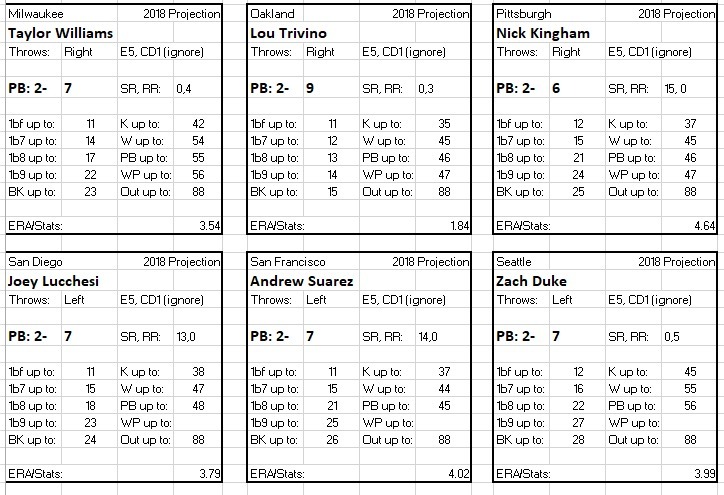 Glasnow is actually looking like hie could be good this year, but in Statis-Pro he hwas one of the worst cards in the game because it is based on his 7.69 ERA with the Pirates last year, and the pitching has run out several times to leave only the option of him or Beeks card below which is based on his projected 5.92 ERA this year. Beeks also has the worst fielding range possible, and E10, which means he will make an error close to one in 10 balls hit to him. A funny Statis-Pro story, you may notice the Diego Castillo card next to him shows a very good pitcher but also has an E10. the funning thing is Castillo actually calculates to an E100, because in 27 innings pitched he only attempted to field one ball and he made an error on it for a 0.000 fielding percentage. The funny part is the first game I used Castillo in the Rays goofy starter by committee system, he relieverd short starter Stanek and a ball was hit to him and he made an error (even though there was less than a one in 10 chance in the game. We sometimes joke the Statis-Pro gods make adjustments beyond the cards!